To make a Sherman III / M4A2 I tested the UM kit. I was already aware that both Heller and Dragon are superior in quality, but for the sake of adventure and in the prevision of having a dozer blade, a 17pdr barrel and a Firefly radio box for other projects I bought one. 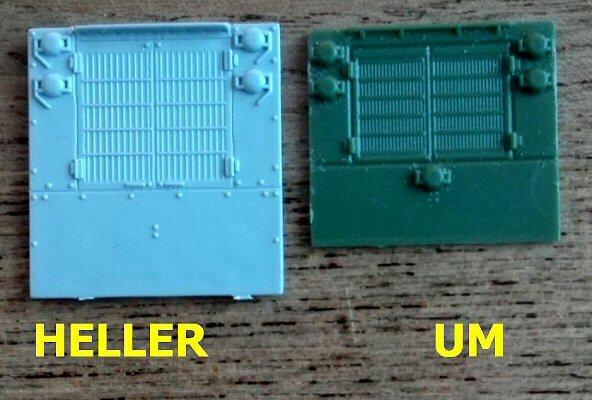 The moulds were in the same pine green I found in the M10 and M4A1 kits. 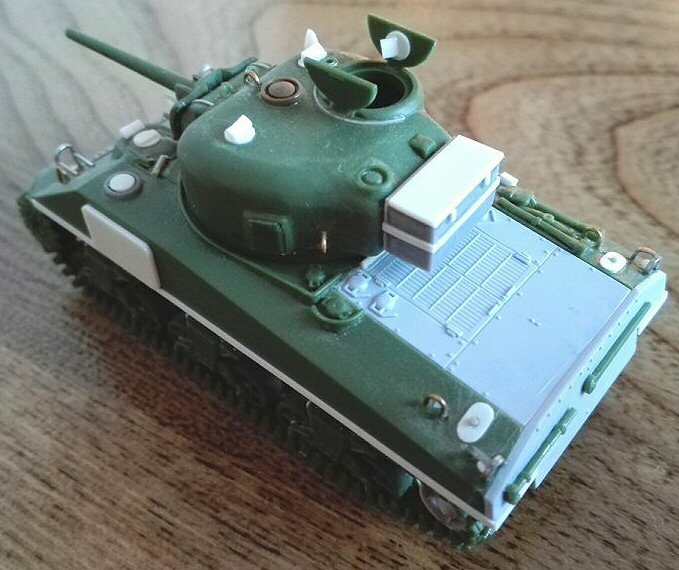 Some moulds are shared by these kits, because UM smartly adopted a modular philosophy in making the Sherman tank variants. 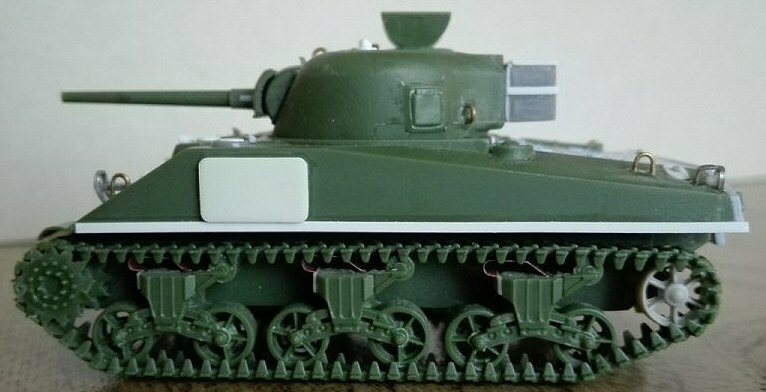 The kit is composed of seven green plastic mouldings marked by letters, two identical “A” for the wheels and the tracks, “B”, “C” and “E” for the hull, “D” for the turret while “K” is the dozer blade. A little PE fret marked “F” has the bogies skids, the brush guards, the inner sides of the fenders, the plates for the dozer strut and the transmission cover bolt heads strip. The variant proposed is a mid/late production M4A2 75mm, as built by Federal Machine Works or Pullman. At this production stage, the Fisher plant already had transitioned to the fabricated glacis hoods and antenna bracket, while the ALCO and Baldwin M4A2 had the early standard DV hoods and M34 gun mount. At the first glance, the kit could give a good impression. The tools are positively moulded as separated parts and not solid on the hull. Other, useful, nice spare parts are the ones needed to convert a normal turret in a Firefly turret. 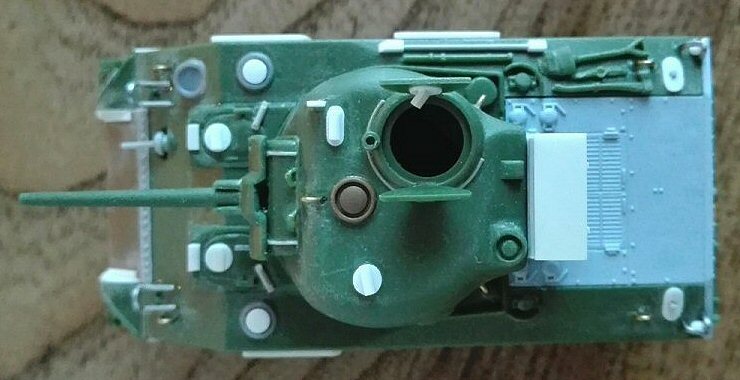 Closer observation points out the problems of this kit are in the transmission cover (which is much too thick on the edges), in the engine deck and the rear plate/exhaust layout (which are wrongly depicted). The dimensions are quite correct, if the transmission cover is changed or corrected. If left as it is, this M4A2 is a couple of millimetres too long with the transmission cover wrongly overhanging the tracks. 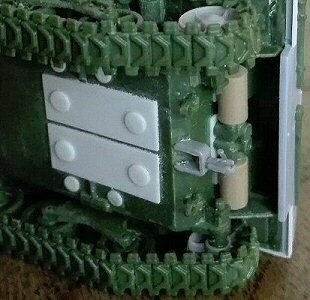 Other critical points are shared by the cast hull kit and the tank destroyer kit I made, like the wheels, the sprockets, the tracks, the bogeys and the fragile lower hull construction. Additionally, a lot of pin ejector marks need to "disappear" by either filling or sanding. 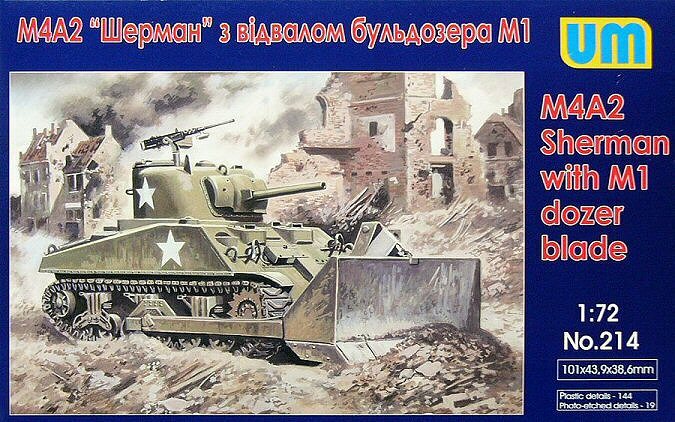 I choose to make a Sherman Mk III in NWE. I used the following references to get everything correct : the Hunnicut book and the Squadron Signal booklet, while on the net I used http://the.shadock.free.fr/sherman_minutia/index.html. To give a stronger and correct placement, the sponson floors needed some sprue segments glued transversally inside the hull (see photo). The transmission cover shape is wrong. Its correction is possible, but having a spare ESCI/Italeri piece at hand I used this one, adding the bullet splash lip and new towing points. The PE bolted stripe is not well made and I had some problem trying to use it. I replaced it with a spare part. The rear edge of the crew hatches piece need to be worked to have a clean interlock. Its sink marks need to be filled. Paying attention I filed the curved side until the sloped side was flush with the glacis plate. The joints were filled with cyanoacrylate glue. The periscopes, damaged during reshaping, were replaced by triangular plastic rod segments. The hatch hinges were adapted to allow the hatches fall flat in the oval holes. Very simplified, I replaced the periscopes after having glued the rotating base made by plastic sheet. I added also the counter balance springs by solid stretched sprue; they are too small to be made in metallic wire wrapped around a rod (at least for me). 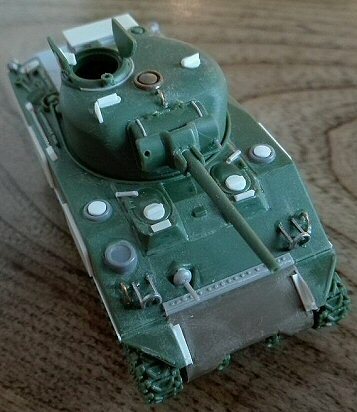 The 56° glacis upper hull is shared by both M4 and M4A2 kits. Whatever Sherman mark one chooses, the antenna bracket needs to be replaced being not well done (Tip : each Heller kit gives you a spare one). In this case, the donor was a spare PSC M4A4 upper hull. To ease the job, this replacement needed to be made after the hatches placement. The .30 MG and its ball mount were replaced by a scratch build part. The smoke extractors (placed just outside the crew hatches) are undersized and not well placed. I replaced them, taking two from the PSC M4A4 upper hull (they needed to be corrected with a larger centre). The lifting points were replaced by metallic wire bent over a template. The engine deck is not well done. I had a Heller M4A2 one (which is correct) in my spare box, so I replaced it moving the bullet splash backward to make room for the turret (there were more patterns, so I don’t mind losing the bolts housings). The engine deck correction is very hard and replacing it is a better way. Other alternatives are simply ignoring that error or making a different variant. The fenders inner wall and details were made by plastic sheet. The rear lamps were made by shaped plastic rod segments, while I omitted the forward ones because usually removed. The brush guards were replaced by scratch build ones. I omitted also the horn because, in the photo I’ve seen, it seems to be removed by the Brits. Placing the shovel showed the handle length is 1 mm too long. I cut it to length and reshaped the blade a bit. The oversized metal bar (a tool on the right side of the hull) was replaced by one having the correct length. The square housings holding it in place were made by plastic rod segments. The grouser vane caps were made by plastic sheet. 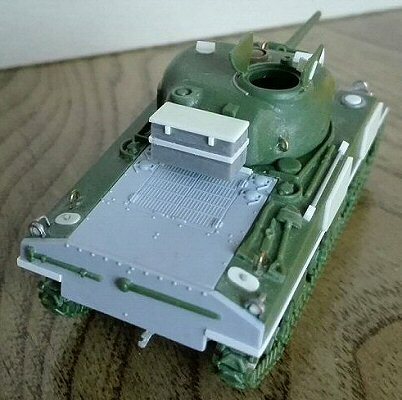 The M4A2 ones didn’t have the air scoop. The rear plate badly interlocks with the upper hull. I glued it aligning the parts on the upper side corner. Then I filed flush the upper edge. This left 0.5 mm gap on the lower edge, but it was hidden by the sand skirts supports. Having one, on this I did add a spare Heller rear plate who looks better thanks to the moulded on bolt heads correcting the plate angle (check it). The kit one is flat with some sink marks and covering it with a plastic sheet shaped in place would be recommended. The exhausts are done very badly. I used two large sprue segments for the mufflers and four thinner corners to make the bent pipes. After having built these pieces from scratch, I glued them in the correct layout and then opened the exit ends. The flange was lowered with plastic sheet because it is placed much too high. The towing hook is missing; a spare part from Dragon solved the problem. The bustle bottom was horizontal; I filed it to the correct shape. The antenna socket splash guard was cast integral with the turret and is not a rounded piece welded on it. I filled the base with cyanoacrylate glue and then smoothed the joint. I used sand paper to round the forward bulges. The smoke extractor diameter is a millimetre too narrow. A spare Italeri turret to be scrapped was the source to have another one. 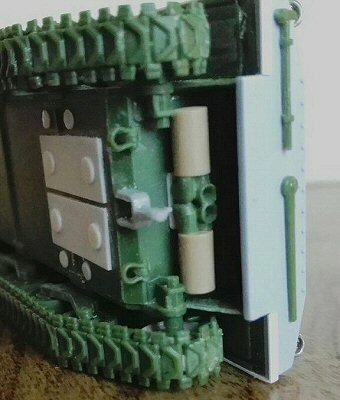 The M34A1 gun mount is totally flat, I added the vertical reliefs casted on by thin stretched sprue, the little lifting points were added using the unused 61B pieces. For a M34 gun mount the specific pieces are supplied; although they need a bit reshaping (always refer to photos). The gun barrel end was drilled open. The mantlet sides overlap too much the mount. I filed the sides, narrowing the mantlet to 13.5 mm. The co-axial .30 barrel was added by stretched sprue and the gun sight hole was drilled open on the opposite side. The periscopes were replaced by plastic sheet and triangular rod segments. I added the aiming blade with 0.5 mm plastic, thinned in place. I added the NWE turret bin, making it from scratch. The lifting points were replaced by metallic wire. The location for the pistol port on the turret is a big hole. I therefore attached a plastic piece on the inside of the turret and filled up that hole before I glued the pistol port in a raised position. Externally the edges were filled with cyanoacrylate glue and shaped with file and sand paper (see here: http://the.shadock.free.fr/sherman_minutia/turret_types/75mm_turrets.html ). 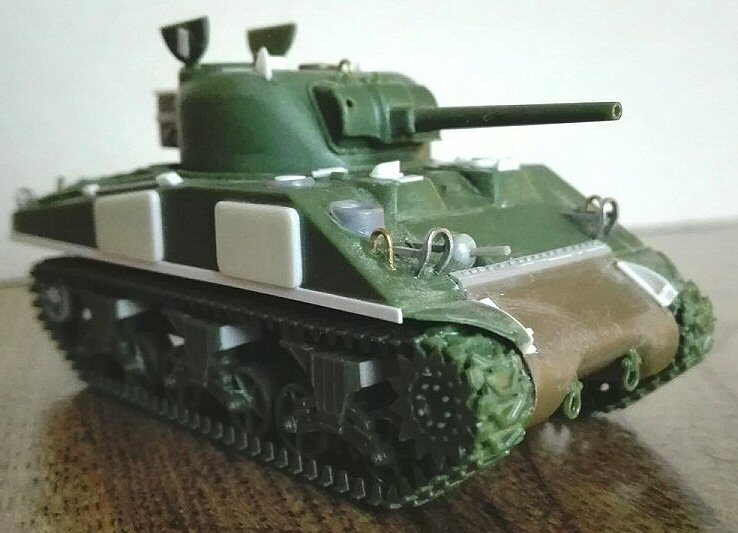 This is the third UM kit of a Sherman based vehicle I bought and reviewed (I already made the M4A1 and the M10) and it's the first time I had a couple (just one) of sprockets without the deep sink in the centre. This time I used them, although the details are still shallow. The pressed wheels are, in my opinion, not usable, while the open spokes wheels are better made, so I used these. The idlers are supplied only in the pressed type. Having a spare couple from Trumpeter I replaced them. The bogeys details are shallow as well, but the shape is quite correct. Only the bogey fronts need to be reshaped after having glued on a piece of thin plastic. 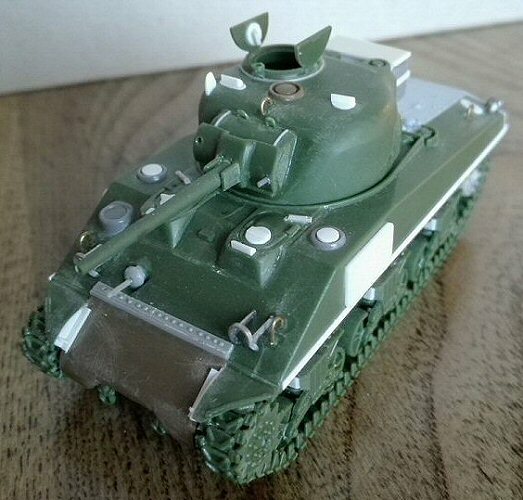 The tracks are the same for every UM VVSS Sherman tank kit, and are similar to the T54E1. Look here http://the.shadock.free.fr/sherman_minutia/tracks/vvss_tracks.html . I used them as they are. The set provides the markings for only one tank: A-6, APACHE, of the 746 TB. The bumper codes are missing. This is not the worst news. APACHE was a well known M4, not a M4A2 (!!!). The registration number 3036904 given by this kit is for a Baldwin tank, while the photos of APACHE clearly show an ALCO or a PULLMAN tank. Not only the registration number is incorrect, the original APACHE had the bolted transmission cover and the full appliqué armour set. A full decal set can be found in the Bison Decal set 72009, which I hope will be re-printed by the new company Star Decals. The kit set gives also the name ALLEY OOP and the individual bumper code A10; I didn’t find photos of this tank. The “A” name corresponds to the A Company, accordingly to the normal practice it should mean an Independent Tank Battalion or an Armoured Division with the new TO&E standard. The 1st, 2nd and 3rd Armoured Divisions had the former “heavy” TO&E and their A, B and C Company had light tanks. The marking 8V14 and the segmented circle present in the set, look to be part of markings used for tests in the stateside off which I don’t have the photo. The kit errors are not minor ones and correcting them is not an easy job. 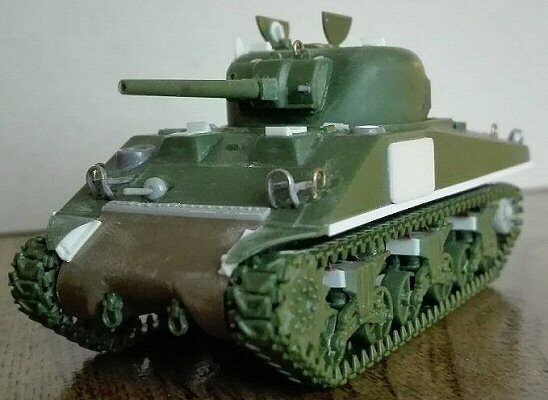 If not corrected, this model hardly can be compared with the better kits (such as a Dragon or a Heller) even if these are built straight out of the box. The positive points are the presence of the dozer blade and the Firefly spare parts. Being a modular kit with most of the parts in common with the M4 kit # 370, the generic correction described can be used also to improve that M4 (paying attention to the M4 production plants differences) and not only the other M4A2 kits (# 223 and 372).